30th day of the year with 335 days to follow (336 in leap years). 1820 Edward Bransfield sights the Trinity Peninsula and claims the discovery of Antarctica. 1835 In the first assassination attempt against a President of the United States, Richard Lawrence attempts to shoot president Andrew Jackson, but fails and is subdued by a crowd. 1862 The first American ironclad warship, the USS Monitor is launched. 1911 The destroyer USS Terry (DD-25) makes the first airplane rescue at sea saving the life of James McCurdy 10 miles from Havana, Cuba. 1948 Indian pacifist and leader Mohandas Karamchand Gandhi known for his non-violent freedom struggle is assassinated by Pandit Nathuram Godse, a Hindu extremist. 1969 The Beatles’ last public performance, on the roof of Apple Records in London. The impromptu concert is broken up by the police. 1971 Carole King’s Tapestry album is released, it would become the longest charting album by a female solo artist and sell 24 million copies worldwide. 1975 The Monitor National Marine Sanctuary is established as the first United States National Marine Sanctuary. 1982 Richard Skrenta writes the first PC virus code, which is 400 lines long and disguised as an Apple boot program called “Elk Cloner”. 1994 Péter Lékó becomes the youngest chess grand master at age 14-years. 1995 Workers from the National Institutes of Health announce the success of clinical trials testing the first preventive treatment for sickle-cell disease. An American and an Irishman were enjoying a ride in the country when they came upon an unusual sight – an old gallows. “Riding alone,” coolly replied Paddy. Mary taught first grade. She had a class of twenty-five adorable 6yr olds. One day Mary gave each child the first half of a well known proverb and asked them to write in the remainder of the proverb. It’s hard to believe these were actually done by first graders. While reading the results, keep in mind that these are only first graders, about 6 years old. ~ No news is………………………. impossible. ~ Love all, trust………………….. me. ~ An idle mind is………………….. the best way to relax. ~ Strike while the…………………. bug is close. ~ A penny saved is…………………. not much. ~ Don’t change horses………………. until they stop running. ~ A miss is as good as a …………… Mr.
~ Happy is the bride who……………. gets all the presents. ~ Two’s company, three’s……………. the Musketeers. ~ Don’t bite the hand that………….. looks dirty. ~ It’s always darkest before………… Daylight Saving Time. ~ There are none so blind as ……….. Stevie Wonder. ~ Where there’s smoke there’s ………. pollution. ~ The pen is mightier than the………. pigs. ~ If at first you don’t succeed……… get new batteries. ~ When the blind lead the blind …….. get out of the way! ~ Children should be seen and not …… spanked or grounded. ~ You can’t teach an old dog new ……. math. ~ Don’t put off till tomorrow what…… you put on to go to bed. Myra was going to the office party but needed a new party dress. “Is Mr. Smith there?”, asked the client on the phone. “I’m very sorry, but Mr. Smith passed away last night,” the receptionist answered. “Is Mr. Smith there?”, repeated the client. “Is Mr. Smith there?”, asked the client again. Over a round of golf, two doctors were talking shop. “I operated on Mr. Lee the other day,” said the surgeon. “What for?” asked his colleague. A man in a tuxedo pushed his way towards her. “I’m a doctor” he said. A thief in Paris planned to steal some paintings from the Louvre. After careful planning, he got past security, stole the paintings and made it safely to his Honda Odyssey. However, he was captured only two blocks away when his vehicle ran out of gas. (See if you have deGaulle to share this with someone. I posted it because I figured I had nothing Toulouse since it is the Cezanne of Bastille Day). And don’t want to be a bore!! So I must say good-bye my dear. I had opened it instead!! My hearing aid works…but ..I do miss my mind!!! “How did you know I was speeding?” the frustrated driver asked. He grabbed the book out of her hands and started thumbing through the pages. TODAY IN TRIVIA: What is the Season for Nonviolence about? It is a yearly event celebrating the philosophies and lives of Mohandas Gandhi and Martin Luther King Jr. The “season” begins with the anniversary of Mohandas Gandhi’s assassination on January 30 and ends with the anniversary of Martin Luther King, Jr.’s assassination on April 4. It is anchored by a mission, statement of principles, and commitments by participants towards living in a nonviolent way. The annual 64 day campaign was co-founded in 1998 by Dr. Arun Gandhi and The Association for Global New Thought (AGNT). The purpose of the campaign is to focus attention on the philosophy of attaining peace through nonviolent action as demonstrated by legendary leaders Mohandas K. Gandhi, Rev. Martin Luther King, Jr., Cesar E. Chavez, and President Nelson Mandela, as well as living legends such as His Holiness, Tenzin Gyatso, the 14th Dalai Lama of Tibet. ~ Which dog leads the blind in England? 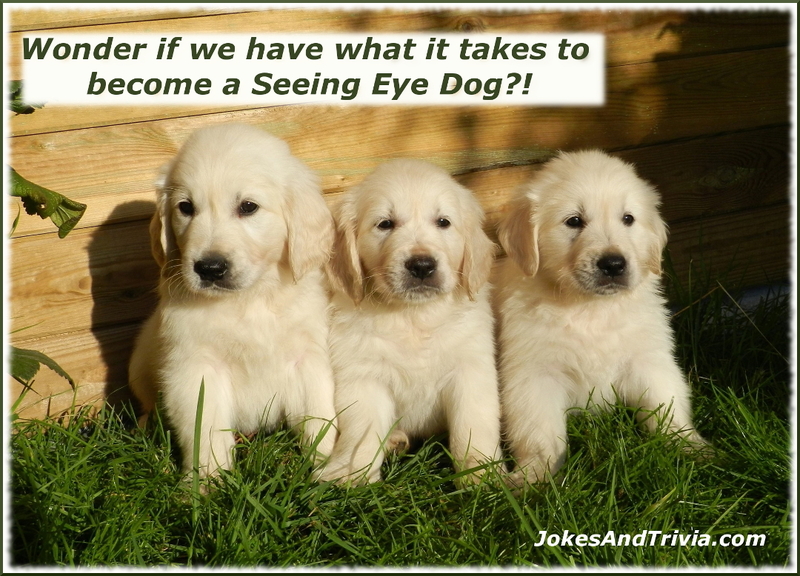 In England, the most commonly used guide dog for the blind is the Yellow Labrador Retriever. See how they train Yellow Labs in the UK to become a Seeing Eye Dog! ~Why do javelinas travel in groups? Javelinas are free-ranging, yet territorial animals that travel in small herds. One of the reasons they travel in numbers is so they can huddle to stay warm — they don’t handle cold well and can freeze to death quickly. QUIP OF THE DAY: Everyone has his day and some days last longer than others – Winston Churchill.